Over the many months of continuous searching for vintage Lanvin perfumes on eBay, I had come across many Lanvin’s perfume ads and posters. 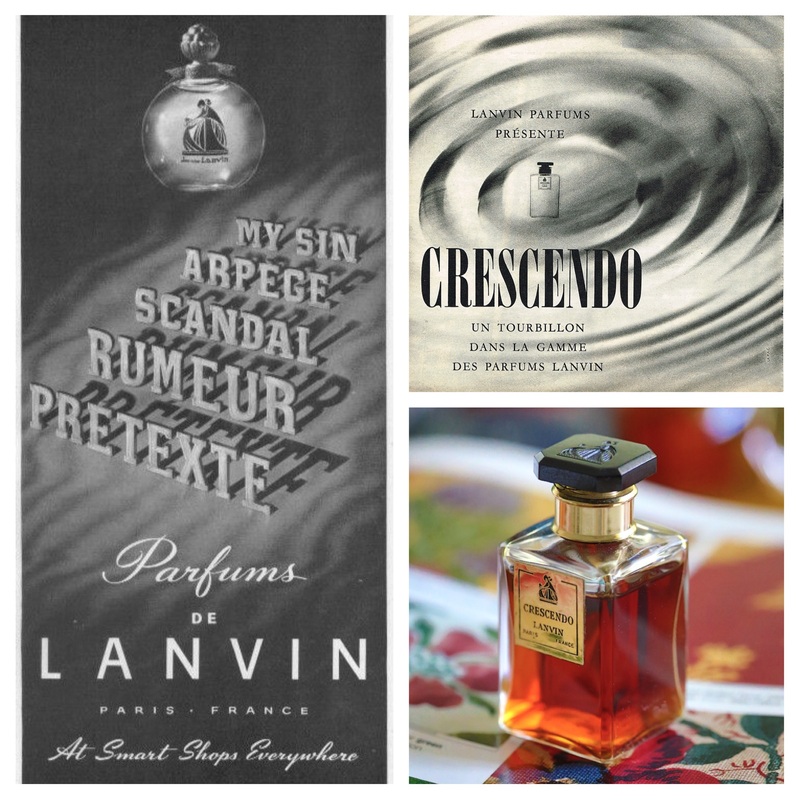 For more than 20 years since late 1930s, Lanvin had been grouping “My Sin”, “Arpege”, “Rumeur”, “Scandal” and “Pretexte” together in their printed ads, almost like a frequent reminder that those were their best perfume offerings. (They were. 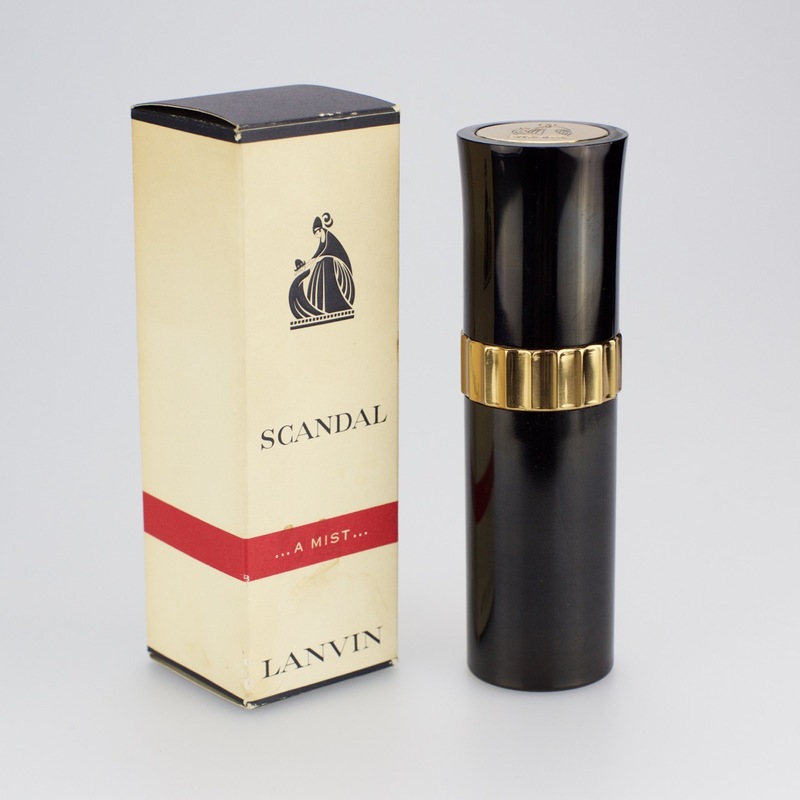 Lanvin had had other perfumes released throughout those years, but they were never a big hit.) In 1958, Crescendo debut. (Some sites say 1965, which I think is incorrect because periodicals from 1958 already mentioned of Crescendo.) It seemed to me that Lanvin was trying to make it another hit to join the “classic five”, but it had never succeeded. The big wave crests that Lanvin wanted Crescendo to make turned out to be ripples in a quiet pond, and in 1969, Lanvin discontinued it. Overall, I think Crescendo is one of the better extraits that Lanvin have ever produced, despite its short-lived glory. 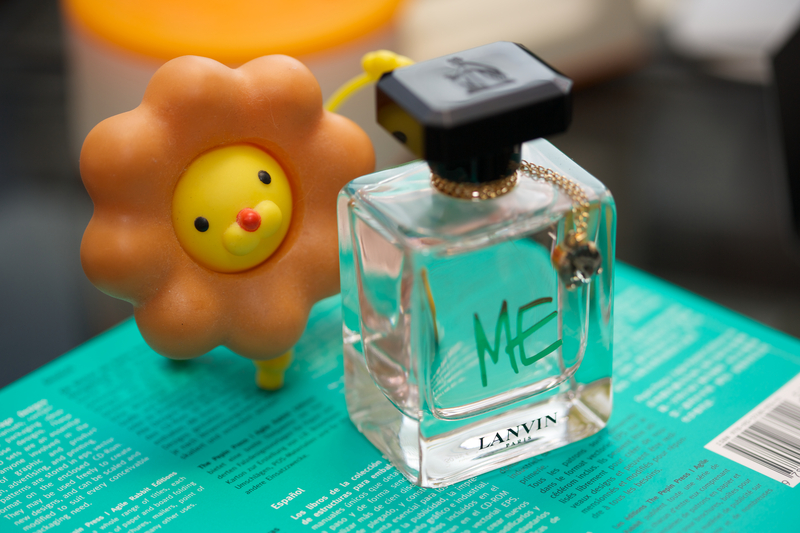 I’ll tell you one of the strange reasons why I started collecting vintage Lanvin perfumes about a year ago – there were only six to collect, which I thought was an easy thing to do and not too costly. (Later I found out it’s not always the case.) 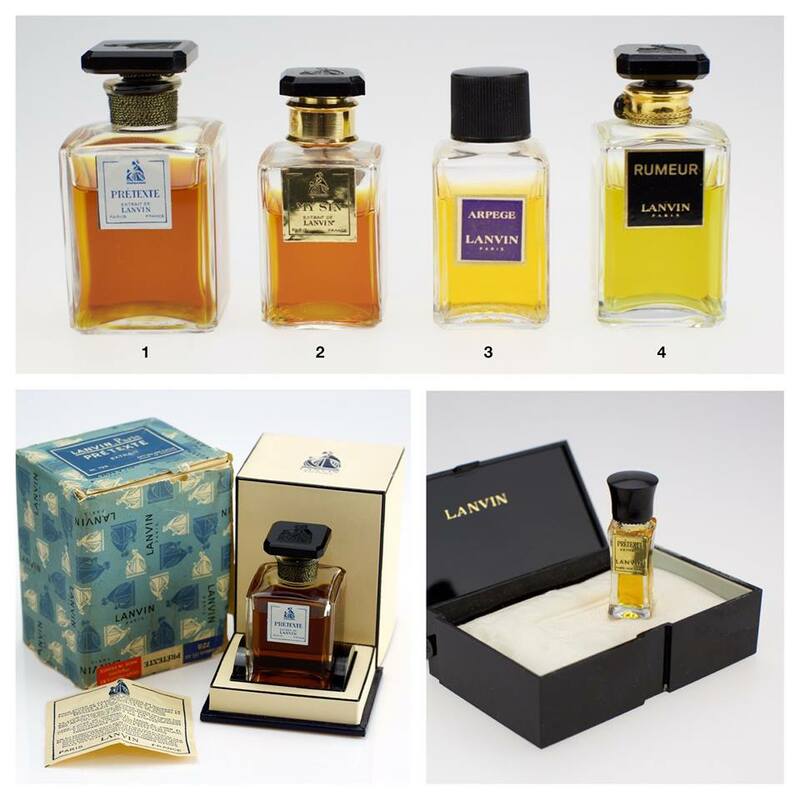 Mind you, it is not a “completist set”, for Lanvin had released over 30 perfumes between 1923 and 1987 (and a hiatus of 13 years before they released Oxygene in 2000), sadly, most of them got discontinued and forgotten, and only a few were big hits and had sold well enough that you can still find them on eBay. The six scents are Mon Peche (or My Sin, 1925), Arpège (1927), Scandal (1931), Rumeur (1934), Prétexte (1937) and Crescendo (1965). I began collecting Lanvin perfumes after smelling the modern reformulated Arpège at a shop and bought it without hesitation. It was so marvellous. Not for long, I started collecting vintage Arpège, and the snowball got bigger, as always. (And my vintage Arpège collection is a totally different monster.) Out of the six scents, vintage Arpege is the easiest to collect for Lanvin had sold thousands of truckloads of them. My Sin is the second easiest, probably because of the name, and the scent, for it was suggestive that a lot of women bought it to become an imaginary sinner in the mid 20th century. 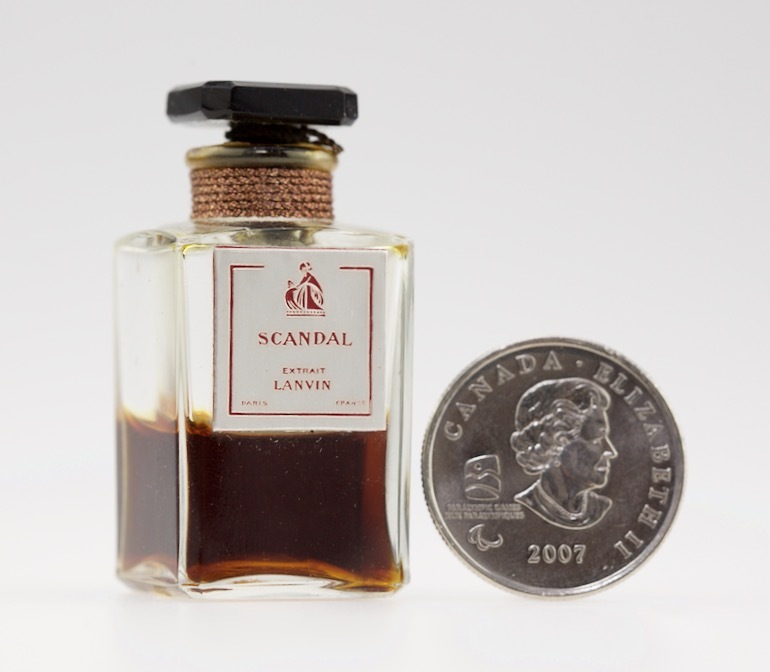 Vintage Rumeur and Prétexte are rare now, and you will be very lucky to find a full bottle of Scandal or Crescendo extrait for under $150, if it ever shows up on eBay. I am not the only fan of my so-called “Fantastic Six”, Edmond Roudnitska, one of the greatest French master perfumers, had called Arpege, Scandal, Rumeur and Prétexte “the most spectacular tetralogy in the history of perfumery”. * Having one hit perfume is already difficult, but having four, and each intentionally or unintentionally smelling like it complements each other to complete a perfumery four-piece medallion is ultra difficult and awesome. 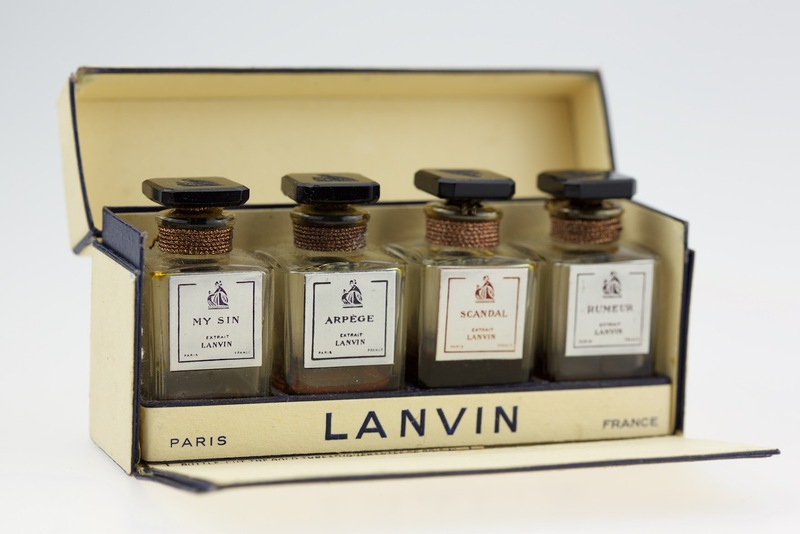 Recently I have acquired a vintage “cofferet set” of mini Lanvin extraits, and what’s so special about this set is that all the bottles are unopened (although only 1/4 is left due to 80 years of lonesome meditative evaporation), and they are from the same manufacturing period. I think I can finally tell how different each scent is, for a lot of vintage perfumes tend to smell very similar for the top notes are all gone or ruined, and only left with very commonly used base note ingredients. My college classmate was very excited by this rumour, because all he cared so far in his life was getting full marks in his exams with minimal effort. That was, I think, 25 years ago. In Turin/Sanchez’s Perfumes book, Sanchez pulled the same stunt by writing something similar for Lanvin Rumeur’s review. She wrote, “Baseless”, and gave it one star. Sorry, if I were the professor, she failed the exam. Nevertheless, I was intrigued. They gave Molecules a three star review, but Molecules was well known for having just one ingredient in the formula – ISO E Super. It’s more baseless than baseless, it’s negative baseless, so I guess that makes it positive. But Rumeur is something special. It was designed by Francis Kurkdjian in 2006. Yes, that dude. He’s famous, a super star in the industry. His “Oud” perfume from his own line, costs f*king $450 a bottle. Rumour, cost me $29 for 100ml. What’s going on? Is a perfume without a base considered a failure? (and does he over-price his perfumes? 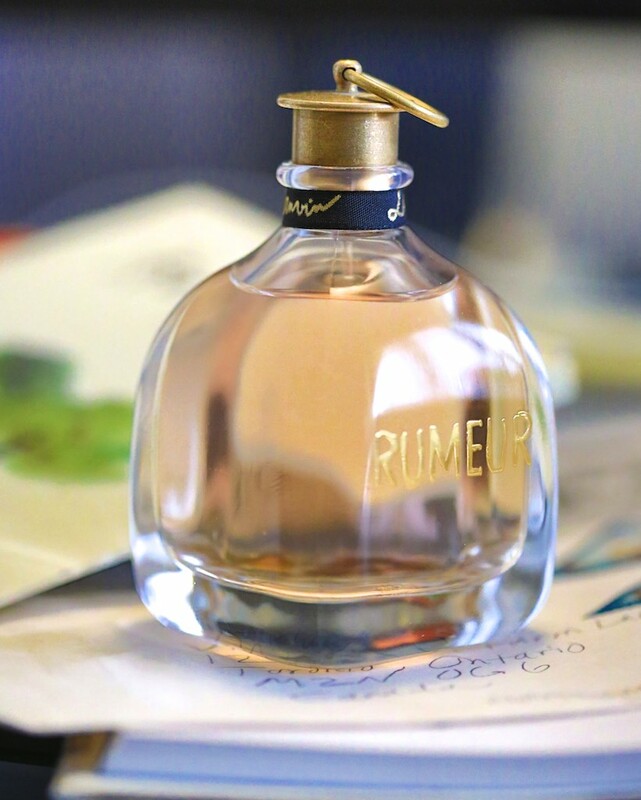 *evil-eye*) There’s actually a “Rumeur 2 Rose” perfume, implying that Rumeur 1 was a commercial success to Lanvin. I own a few perfumes that I think smell great, but in my opinion, baseless or almost baseless. To me Rumeur is a faux light skin floral, (there’s a market for that) but it’s so light, all you get in the first 5 seconds is alcohol, then something crazy synthetic like nail varnish. To justify I have spent good money on a perfume made by MJK, I sticked my nose to my skin like a vacuum cleaner, and yes, it’s all there (pear, rose, jasmine, aldehyde, etc. ), but they were not leaving my skin. I didn’t get any joy smelling it on myself, but I want to smell it on someone else, particularly a young woman with long hair, who also thinks this perfume is light, and she over-applies it, making herself a beast. May be that’s Mr. Kurkjian’s intention. Sorry, Ms. Shyamala Maisondieu, the nose of Lanvin’s Avant Garde (2011), your creation belongs to the Commercial Art Museum, not the Avant Garde Museum, because it shocks no one (in fact, it’s quite a crowd pleaser), pushes no boundaries and repels no one in any elevator or restaurant. In fact, it smells a little bit like Hugo Boss Bottled (1998), a sweet and friendly apple juiced-up semi-masculine cologne; and you sneakily replaced the apple with some honey, tobacco, pink pepper and white pepper to warm it up, making bad boys smell a bit friendly, and boring clean-shaven office men a bit bad boy. All-in-all, it’s a decent modern designer scent, but what I find so interesting is not what it smells like, nor its nice bottle. What I find interesting is that I have witnessed a real-time social-media-influenced sales phenomenon happening in slow motion. I have always wanted to get Avant Garde, because I’m a Lanvin fan. I love Arpege, and I think I should also love her extended family despite some of them are only as interesting as a pumpkin. What I didn’t expect was that someone bought a bottle of Avant Garde at a discounted price and reviewed it on Youtube, which caused a domino effect of other Youtube reviewers getting their own bottle and saying how good and affordable it was. Before the Youtube reviews appeared, Avant Garde was readily available at my favourite online shop. Ever since the reviews, fewer and fewer were available (didn’t happen to other perfumes that I paid attention to), until I found out they were sold out. (Pulling hair out.) I have concluded it’s all because of Youtube reviewers! Good job, guys! Last weekend I had dinner with a group of people that I didn’t know well. Sitting next to me was a woman in her early forties, and I asked her if she liked perfumes. 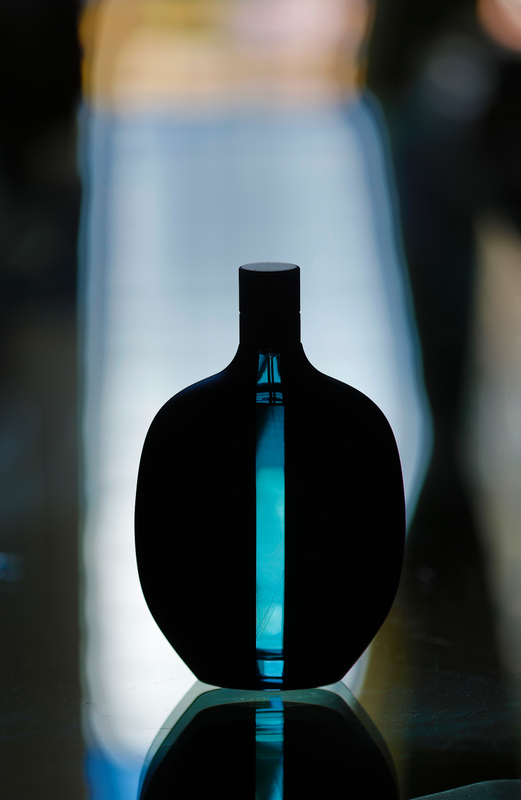 She confessed that she wasn’t into perfumes; she had only a few bottles, but was very attracted to cool-looking bottles. She told me that she wanted a bottle of Marc Jacob… “Daisy?”, I said. “Yes. I can’t remember those names.” Then I asked her what kind of scent did she like and here’s the interesting part – she said that she liked light and fresh scents, “You know, something that almost disappears when you are ready to leave the house.” I almost spewed water from my nose. Here’s the moment when I realized I had accidentally stepped into a parallel universe. So in front of me is a bottle of Lanvin ME (2013). Got it because I love Lanvin’s Arpege and saw it in a discount bin. A few sprays on my wrist, and I immediately thought of that woman at the dinner table. I guess there’s nothing to report here – it’s a light fresh blueberry scent. Just as I thought I could close the books, it threw a curve ball at me. It’s fresh, sweet and sunny and suddenly there’s a grey cloud of liquorice coming out from nowhere and turned the scent semi-masculine and almost “noire”. It’s so unexpected that I can’t decide if I like it or not, but definitely I keep smelling it. It’s like those two-faced duet by the same person –she turns around and she becomes a he. Interesting but awkward.